HERPA Model: one limited edition collectible, die-cast airliner model, in a 1/200th scale of a Douglas DC-6B in the Panagra - Pan American Grace Airways Old 1950’s Colors Scheme. With a Polished Metal finish and titles El Pacifico. Airframe Registration N90878. Model Stand included. This model is constructed of die-cast metal with some plastic parts. This product was released in Released in August, 2013. 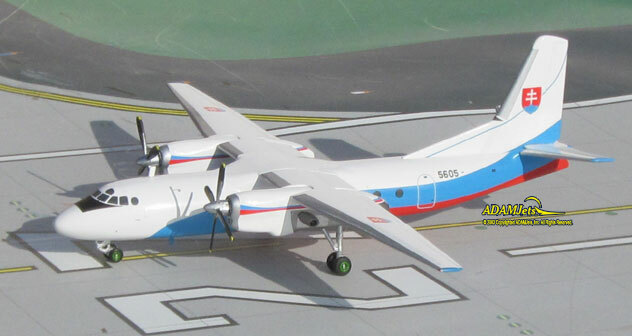 HERPA Models: one limited edition, collectible die-cast metal airliner models in 1/200th scale of the Antonov AN-24B in the Polar Airlines - Polyarnye Avialinii Current Colors. Airframe Registrations RA-46333. This model is constructed of die-cast metal, molded with some plastic parts. This product was released in Released September, 2012. 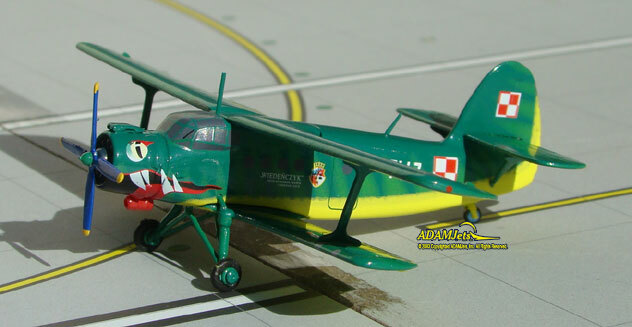 Herpa Models: one limited edition, collectible molded plastic military model in 1/200 scale of an Antonov AN-2 in the Polish Air Force Special "13th Eltr. 40th Anniversary" Colors. With titles ?Der Wiener?. Airframe Registration 7447. The model is constructed of molded plastic parts. This product was released in July, 2011. HERPA Model: one limited edition, collectible die cast airliner model in 1/400 scale. All construction is made of metal with some plastic parts, of an Lockheed Electra L-188A in the PSA- Pacific Southwest Airlines Old Colors. Airframe Registration N6118A. This models is available as of July, 2006. HERPA Models: one limited edition collectable, die-cast metal airliner model in a 1/200th scale of a Fokker F-100 in the Qantas AirLink Airways Current Colors Scheme. Airframe Registration VH-NHP. This model is constructed of die-cast metal with some plastic parts. This product is available beginning in June 2018. HERPA Models: one limited edition collectible, fully assembled, and highly detailed die cast airliner model, in a 1/200th scale of a Bombardier DHC-8-402 in the Qantas Airways Current QantasLink Colors Scheme. Airframe Registration VH-QOK. The model is constructed of metal with some plastic parts. This is a collectable model, not suitable for children under the age of 14 years. This product was first released in May, 2019. HERPA Models: one limited edition collectable,die-cast metal military model in a 1/200th scale of an Boeing-Vertol Chinook CH-47�Helicopter in the RAF - Royal Air Force�UN -�United Nations�Colors. Airframe Registration ZD-980. This model is constructed of die-cast metal with some plastic parts. This product is available beginning in May, �2014. HERPA Models: one limited edition collectable, die-cast military model in a 1/200th scale of an Airbus A400M Atlas in the RAF - Royal Air Force 70th Squadron, RAF Brize Norton Delivery Color Scheme. Airframe Registration ZM400. This model is constructed of die-cast metal with some plastic parts. This product is available beginning in May, 2016. HERPA Models: one limited edition collectable, die-cast military model in a 1/200th scale of a Boeing-Vertol Chinook HC-2A Helicopter in the RAF – Royal Air Force 27th Squadron Colors. Airframe Registration. This model is constructed of die-cast metal with some plastic parts. This product is available beginning in February, 2014. HERPA Models: one limited edition collectable, die-cast military model in a 1/00th scale of a Airbus A400M Atlas in the RMAF - Royal Malaysian Air Force Current Color Scheme. Airframe Registration M54-01. This model is constructed of die-cast metal with some plastic parts. Model Stand is included. The product was released in July, 2016. 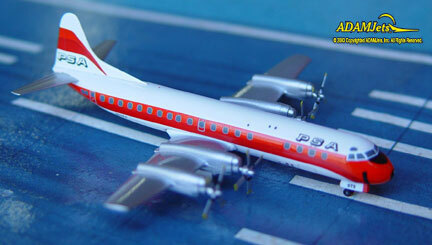 HERPA Model: one limited edition, collectible die cast airliner model in 1/200 scale. All construction is made of metal with some plastic parts, of an Convair CV440 in the Rovos Air then Current Colors. Airframe Registration ZS-BRV. This models is available as of February, 2006. HERPA Models: one limited edition collectable, die-cast metal military model in a 1/72nd scale of a Sukhoi Su-27P in the Russian Air Force Current 4th Combat and Conversion Center Color Scheme. With titles Lipetsk Shark. Airframe Registration 08. This model is constructed of die-cast metal with some plastic parts. This product is available beginning in May, 2016. HERPA Models: one limited edition collectible, fully assembled, and highly detailed die cast airliner model, in a 1/72nd scale of a Sukhoi SU-57 Stealth Fighter (Sukhoi T-50) in the Russian Air Force Prototype Great White Shark Colors Scheme. Multiple types of Ordinance, Model Stand and Landing Gears all included. Airframe Registration N/A. The model is constructed of metal with some plastic parts. This is a collectable model, not suitable for children under the age of 14 years. This product was first released in May, 2019. HERPA Models: one limited edition collectible, fully assembled, and highly detailed die cast military model, in a 1/200 scale of a Tupolev TU-160 in the Russian Air Force Blackjack / White Swan, in the 6950th Guards Air Base, Engels-2, Ilya Muromets Colors Scheme. Model Stand and Landing Gears all included. Airframe Registration RF-94105. The model is constructed of metal with some plastic parts. This is a collectable model, not suitable for children under the age of 14 years. This product was first released in August, 2019. HERPA Models: one limited edition collectible, fully assembled, and highly detailed die cast military model, in a 1/200 scale of a Tupolev TU-160 White Swan in the Russian Air Force 6950th Guards Air Base, Engels-2 Colors Scheme. With titles Alexander Novikov. Airframe Registration RF-94109/12. This model is constructed of die-cast metal with some plastic parts. This is a collectable model, not suitable for children under the age of 14 years. This product was first released in March, 2019. HERPA Models: one limited edition collectible, die-cast military aircraft model in a 1/200th scale of a Tupolev TU-95MS Bear H in the Russian Air Force 84th Regiment / 6950th Donbass Red Banner AFB Smolensk Current Colors Scheme. Airframe Registration RF94178 / 29 Red. This model is constructed of die-cast metal with some plastic parts. This product is available beginning in May 2018. Herpa Models: one limited edition, collectible molded plastic military model in 1/200 scale of an Antonov AN-12 in the Russian Air Force Current "535th Aviation Regiment" Colors. Airframe Registration 26 . The model is constructed of die-cast metal with some plastic parts. This product was released in July, 2011. 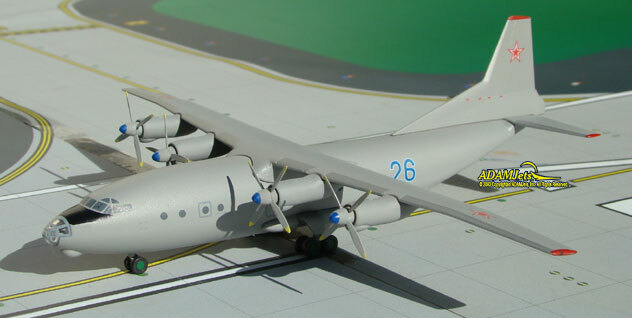 HERPA Models: one limited edition, collectible die cast airliner model in 1/200 scale of an Tupolev TU-154M in the S7 ? Siberia Airlines Current Colors. Airframe Registration RA-85687. The model is constructed of die-cast metal with some plastic parts. This product was released in March, 2011. HERPA Models: one limited edition collectable, die-cast metal airliner model in a 1/200th scale of a Boeing B707-344 in the SAA - South African Airways Old 1960s Springbok Colors Scheme. With a titles Johannesburg and a Polished Metal finish. Airframe Registration ZS-CKC. Model Stand is included. This model is constructed of die-cast metal with some plastic parts. This product is available beginning in November 2017. Herpa Models: one limited edition, collectible die-cast metal, airliner models in 1/200th scale of an Lockheed L-1049H Super Constellation in the SCFA Breitling - Super Constellation Flyers Association Current Colors. Airframe Registration HB-RSC. This model is constructed of die-cast metal, molded with some plastic parts. This product was released in Released October, 2012. HERPA Models: one limited edition collectable, die-cast military model in a 1/200th scale of an Antonov AN-24B in the Slovak Air Force Current Color Scheme. Airframe Registration 5605. This model is constructed of die-cast metal with some plastic parts. This product is available beginning in March, 2016. HERPA Models: one limited edition collectable, die-cast military model in a 1/00th scale of an Yakovlev Yak-40 in the Slovakian Air Force Government Color Scheme. Airframe Registration OM-BYL. This model is constructed of die-cast metal with some plastic parts. Model Stand is included. The product was released in July, 2016. HERPA Models: one limited edition collectible, die-cast military model in a 1/200th scale of a Mikoyan-Gurevich MiG-25PDS in the Soviet Union - Air Force Old 1970’s, 146th Guards Fighter Aviation Regiment, Vasilkov Air Base, Ukraine Colors Scheme. Airframe Registration 52. This model is constructed of die-cast metal with some plastic parts. This product is available beginning in February, 2018. Herpa Models: one limited edition collectable, die-cast metal airliner model in a 1/400th scale of a Bombardier CS300 in the SWISS Intl Airlines Current Colors Scheme. Airframe Registration HB-JCB. This model is constructed of die-cast metal with some plastic parts. This product is available beginning in May 2018.